We are happy to let you know that, Lata is finally shifted to Hinduja hospital-Mumbai .she has been allocated the 25th room on 14th floor of the hospital. 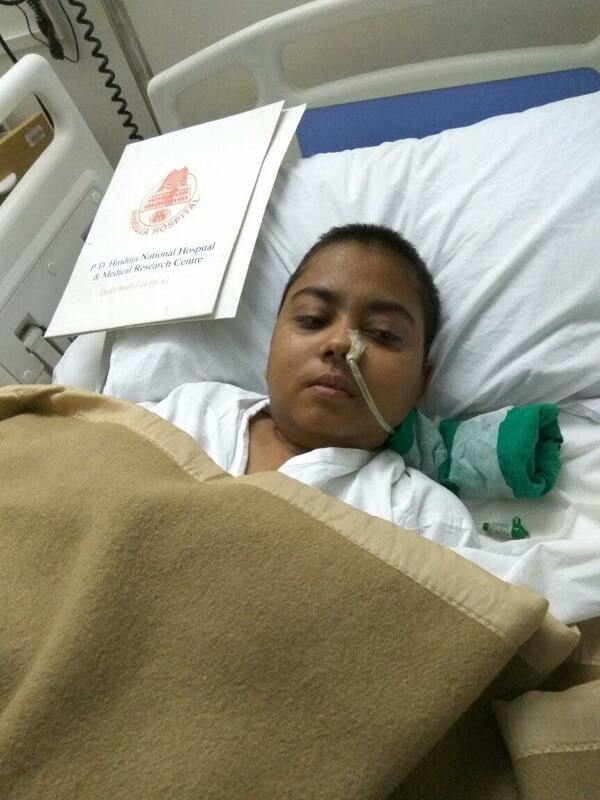 she will be treated under Dr.Udwadia and team. All the discharge formalities from Terna- Nerul was concluded by 21st Jan evening and from there she was moved to Hinduja. As we informed earlier, she had been advised to under go another EVD. 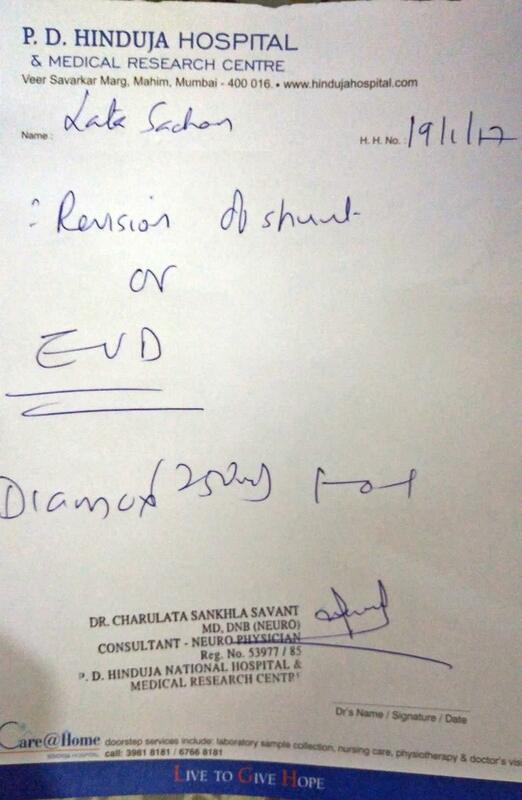 After some CT scans and other tests, a 2am study done by Dr.Mishra and team ,decided to proceed with the EVD. 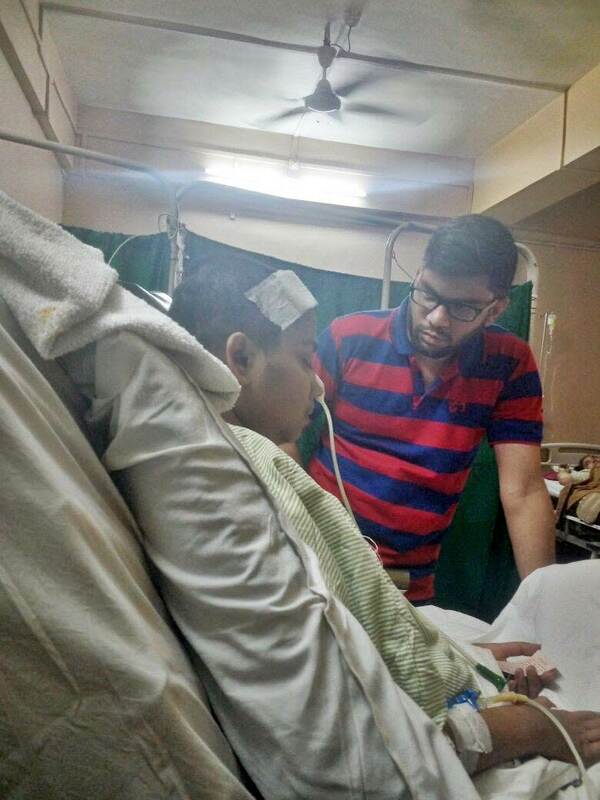 Under the instruction of Dr.Bk Mishra from the neurology department ,the EVD was successfully conducted and ended by 5:30 am morning.Later Lata interacted a bit with the doctors. Interactions only includes -successfully remembering her name and few nodding.Another CFC collection was done. Reports for the same are awaited. Thank you everyone.This is the best we can give her. lets hope and pray for healthy and early recovery. Here is Lata before the EVD. Ask the attendee to call up someone for the visitor pass. We thank you for your amazing support ! With your contributions, we can now think of moving Lata back to the advance care unit of renowned Hinduja hospital of Mumbai. 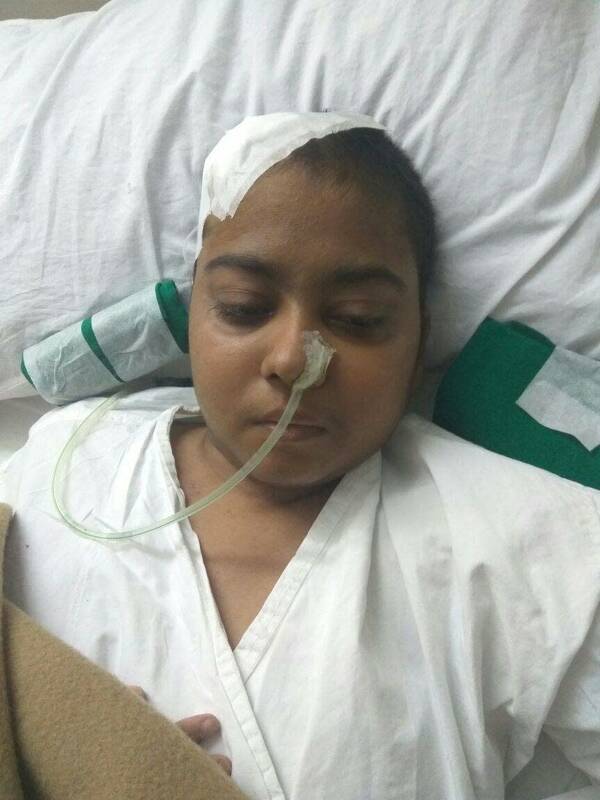 We have got the bed confirmation and we are trying our best to get her admitted under the team of Dr.Zarir udwadia and other neural experts in our country. Without all your support, we could never think of making this bold move. Regarding her health - She has been advised for EDV or revision of shunt. Which means another opening in her skull.Her advice is attached. Below is the last video before the tragic accident.In the video we are trying to make her talk but she isn't responding much.you can see Shruti (her younger sister) ,Late. Shridhar (her younger brother), Mr.Sachan (father) . Lata is still inactive with only eye moments,not responding to any of the actions we make.We keep on trying to make her talk for five to six hours straight. Trying to just keep her awake.Doctors were out of veins for IV feed so they have now moved the injection point to the central nerve on left of her neck. Food intake is oral only when she is conscious otherwise the IV line is used. At present Lata is being treated with series of secondary line of TB drugs.The list of the drugs are attached below.Collection of CSF (protein in brain) is done in a gap of 2 days .The most recent CT scan concluded no improvement.We are reaching everyone for proper guidance. Aunt is still on ventilator ,opening her eyes sometime.Dad is recovering form the broken hands and leg with some support. We are overwhelmed with support from so many known and unknown people.Thank you all for the input .Please share it in your network as well.Let's not give it up on her. Current CT scan summary and list of drugs being used.